Mix flour, salt and sugar in a bowl. Dissolve yeast in water and add to the mixture. Knead until a smooth dough is obtained. Cover the dough and let it rise for one hour. 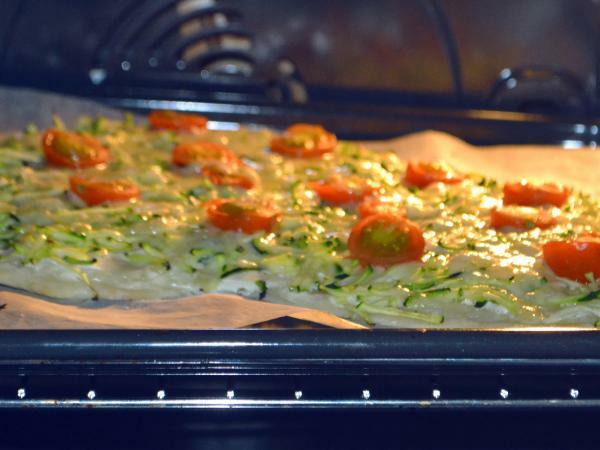 Roll out the dough to a thickness of about 4 mm and place it on a baking sheet covered with baking paper. Season the sour cream according to your taste and spread it on the dough. Coarsely grate the zucchini and spread them over the sour cream. Season as well. Coarsely grate the Raclette valaisan AOP and spread it on the pie. Cut tomatoes in half and spread over pie. Bake the tart in the lower half of the preheated oven at 220°C for 10 minutes.